As the old adage goes, “Anything that looks bad or tastes bad is usually good for you”. This is the case with this body scrub. It looks like the byproduct of a vegetarian lunch. As disgusting as that sounds, it looks just as bad. Aside from the physical appearance, this scrub really got the job done. It left my skin feeling soft and well moisturized thanks to the essential oils and sugar based texture. The scrub leaves a bit of mess because of the crushed olive leaves, so be prepared for a bit of cleaning up. This scrub reminds me of Fresh Brown Sugar, so if you are a fan of Fresh, be sure to check this out. While browsing my local beauty supply store, I came across the Stila It Gloss in Smashing for $10. The sheer pink color with iridescent glitter sold me immediately. This long lasting gloss was not too sticky nor dried out my lips. It had enough shine and glitter without making me look like I am wearing a lip gloss from a makeup set made for little girls. Surprisingly, after 3 cups of water, the gloss itself faded away but it left behind traces of glitter and my lips soft. This chubby lip balm is packed with Organic oils, vitamins, and essential fatty acids. The lip balm does hydrate my lip and keep it soft. It has a soft flowery smell as well. The only drawback is that the product doesn’t last, I am constantly reapplying every 45 minutes. Prada Exfoliating clay mask is creamy and packed with salicylic acid, honey and rice bran. The mask has a rough texture because of the rice bran. It might cause some irritation to people who have sensitive skin. I had to rub the mask really gently to avoid redness from occurring. These individual use packets are super hydrating and leave my skin feeling soft. While the mask is promising, try Clark's Botanicals Intense Radiance Mask for a more bang for the buck. While traveling to Vegas, the airport security confiscated anything more than pinkie size, I needed a cheap alternative. Walking into a Walgreens, I came across this body wash for $1, which I must say is one of the best bargain drugstore find under $5. 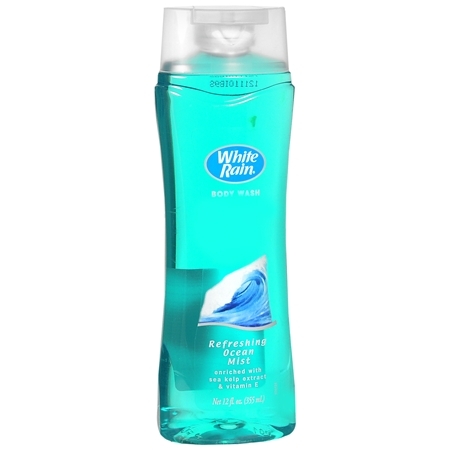 The body wash has a light fragrance, which leaves barely there after scent. It lathers very well and leaves the skin feeling soft and well moisturized. This body wash perform on par with products 5 times as expensive. I have used several hair treatments; many of them leave my hair greasy and tangled. Thankfully, Amika Hair treatment is not one of them. The lightweight oil leaves my tresses softer, smoother and sleeker all after one application. To use, simply evenly distribute a couple drops of the oil through wet hair or dry hair. Apply before blow-drying to add a bit of sheen and no one can tell the difference between a professional blowout or one that you woke up 2 hours earlier to do. Burt’s Bees Naturally Nourishing Milk & Honey Body lotion provides ample hydration to even the driest areas. The creamy formula smells interesting…as in it is not sweet [like milk and honey] nor has a disgusting chemical smell. The smell dissipates shortly after the lotion is applied to the skin. The long lasting lotion goes on smoothly and is absorbed quickly into the skin. The non greasy lotion is packed with Milk, Honey and Vitamin E, along with Coconut and Grape Seed Oils. As each day goes by, our skin becomes a bit older. In our never ending journey looking the elixir of youth, we tend to settle for the next best thing. While it may vary by each person from Botox to surgery, we all try to undo a lifetime of damage overnight. Dr. Loretta Youth Fill Deep Wrinkle Filler claims to turn back the hands of time and help reduce the appearance of wrinkles. The company claims its gel formula resembles the effects of injectable hyaluronic acid by smoothing out wrinkles along with lessening the appearance of other skin imperfections using the skin’s own water content. The gel formula feels a bit greasy but once it is applied to the skin it becomes sticky and the skin feels tight. The tight feeling eventually wears off after 30 minutes. The gel can be left on the skin and rinsed off after 30 minutes or left on overnight and removed in the morning. I personally like using it overnight, since it I believe it would give the product more time to permeate with the skin. After rinsing off the product, I noticed my skin looks more smooth and radiant. Although, I do not think it actually managed to fill in my less than apparent crow’s feet and laugh lines. While it might not be Botox in a bottle, it does seem to improve the overall quality of my skin. Hey, if I can’t get rid of the wrinkles, I might as well have flawless looking skin!